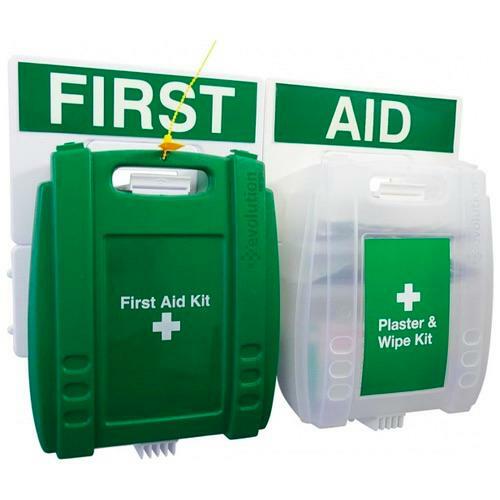 The Evolution First Aid and Plaster & Wipe Points provide you with a fixed location to store your first aid kit and frequently used first aid products. The Point comes complete with a British Standard Compliant First Aid Kit in small, medium and large sizes and a dedicated kit containing Sterile Moist Wipes and Assorted Washproof Plasters. The Plaster and Wipe Kit means people can quickly access the most commonly used first aid supplies and keeps your first aid kit fully stocked and tidy for more serious injuries. The point comes with tamperproof studs that can be used on the first aid kit to deter employees from accessing the kit when the plaster & wipe dispenser is what they require. The point includes wall brackets keeping kits securely on the wall and meaning they can be easily identified when required. The photoluminscent headers mean the kit can be found even in dark or smokey conditions. Kits come complete with adjustable shelves for easy organisation of supplies.